Being an LA newbie I’m still discovering all that it has to offer. A few weeks ago, after admiring an amazing pair of Bed|Stu boots a friend of mine was rockin’, she asked if I had been to Library on Larchmont Street in Hancock Park. In fact I hadn’t… So…off I went to see what all the buzz was all about. 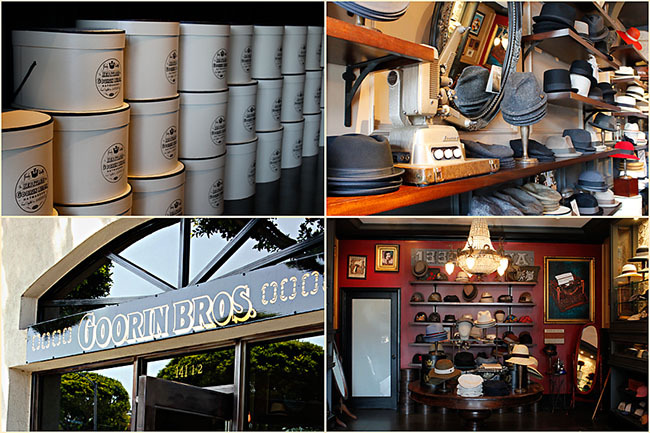 Then…wait for it….there was Goorin Bros Hat Company. Have you been in one of their stores?? I hadn’t. Oh but I will return for sure. There was hats for men, women, kids and all shapes and sizes and then some. The shopkeeper was uber chic and great in helping me find the perfect hat for summer. I didn’t have a whole lot of time to spend on Larchmont but I’m looking forward to making it back very soon!